It’s 1946, rural Ireland. Josie Connors, a young Irish Traveller, sets up camp with her nomadic family on the edge of Ryan’s farm. When she crosses one of the deeply entrenched cultural lines between her Irish (ethnic minority) travelling community and the Irish (settled) community, we are catapulted through decades of unthinkable consequences. “Stuck between two worlds” in abject isolation and poverty, Josie keeps moving, presented with the most compelling reason of all to survive. 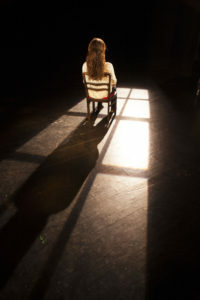 Two for a Girl is an homage to the intimacy and simplicity of traditional Irish theater, a style that can be as affecting on the back of a cart or the corner of a pub as it can on a formal stage. As Mary Kelly seamlessly embodies the five main characters, you will be drawn across generations and to every corner of Ireland in this unique look at identity, freedom and loss when two distinct Irish communities collide. This is a play about the transformative power and absolute necessity of being heard and bearing witness. In commemoration of the 100th anniversary of the 1916 Easter Rising in Dublin, ETB | IPAC continues its exploration of new Irish theater with Mary Kelly’s and Noni Stapleton’s Two for a Girl. The play is performed by Mary Kelly, a Berlin-based actor and playwright who is part of Berlin’s burgeoning international Freie Szene. MARY KELLY is an actor and playwright. She graduated from the Gaiety School of Acting, Dublin, in 2002. Five of her plays have been produced, two of which are published: Unravelling the Ribbon and Two for a Girl. Unravelling the Ribbon toured Ireland in 2008, and had its U.S. premiere in 2010 with the Tennessee Women’s Theater Project. It has recently been translated into French. Since moving to Berlin, Mary was commissioned and has written The Scarlet Web for Big-Telly Theatre Company, Northern Ireland. Mary’s theater work includes Christine Linde in A Doll’s House (Alan Stanford, Second Age Th. Co. Ireland), Lydia in All My Sons (Robin Lefevre, The Gate Theatre) and The Little Mermaid world tour (Big-Telly Th. Co.). TV and film work includes Parked with Colm Meaney (Ripple World Pictures), Fran (Setanta and TV3) and The Clinic (RTE). Radio work includes The Hit List with Brendan Gleeson, written and directed by John Boorman, and Mayday written and directed by Veronica Coburn. Mary’s previous work at English Theatre Berlin includes: two staged readings of new Irish drama during English Theatre Berlin | International Performing Arts Center’s Irish festival The Full Irish (2013) and in ETB | IPAC’s Science&Theatre production of Isaac’s Eye by Lucas Hnath (2013/2014/2015). In January 2016, Mary presented her prose work within the literary event Inkblot Berlin at ETB | IPAC. Two for a Girl is published by The Stinging Fly Press, Dublin.